Director Bryan Garvie reveals his 12 steps to get the results you need from your agency. I’ve been in this game for a little while now, so I like to think I’ve seen most of what agency life has to throw at you. What doesn’t seem to change though is, ironically, the inconsistency with which businesses brief their agencies. I’ve seen everything from “We need some communications support, how much will it cost?” through to campaign briefs which cover so much ground that it’s impossible to work out what’s actually required. Of course, some businesses have experienced marketing teams which write brilliant briefs – but it ain’t a given by any stretch. 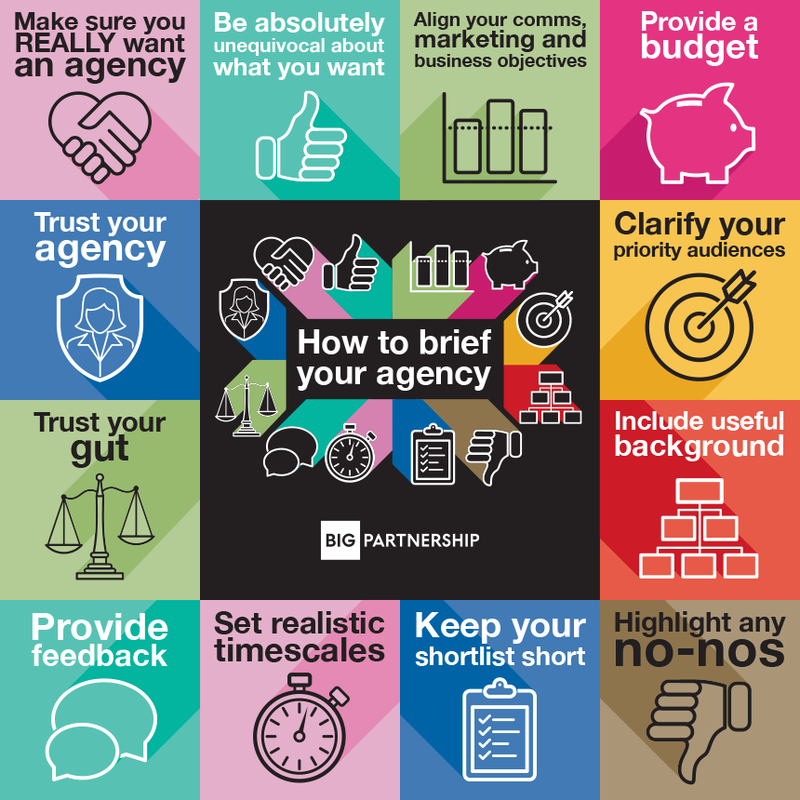 And a good agency brief is one of the most important things for a successful campaign; whether that’s for PR, marketing, web design, advertising – or all of the above. Giving your agency the right brief sets, very clearly, the expectation of what you, as a client, want to achieve by engaging an agency. The benefit is that you should get a better response from the agencies you ask to pitch, which makes your life a lot easier and means the ultimate campaign has a better chance of delivering the results you need. So here’s how it should go. Something about the type of people attracted to agency work means they will pour their life and soul into their response to your brief. I mean to the point of absolute, life-consuming obsession. Research, analysis, late nights, brainstorms, internal briefings of other departments, pitch rehearsal, existential crisis (“ohgodohgodohgod what if I’ve missed the ENTIRE POINT”), the lot. Then after the pitch, maybe you decide you’ll just wait another year. Or you’ll get your in-house person to do it. Or your sales admin (always good for the professional pride, that one). Or you’ve changed your mind altogether. Before you ask agencies to pour hours upon hours into showing you how good they are, make sure you’re positive that you have the time and resource to work effectively with an agency, and that you genuinely value the contribution the right partner can make. Some agencies actually charge for the pitch process, just to make sure you’re serious. Need more sales? Put that in the agency brief. Make it clear what level of additional sales you want, and how you’ll measure that – for examples, is it a percentage increase? A financial figure? Net profit? Is that something an agency can genuinely influence? Give the agency every chance to understand how success will be judged and they’ll start thinking about the problem correctly. That’ll also give you a good place to start when selecting your agency shortlist. Some are specialists in certain areas, and they’re the people you want to speak to. If you simply want to raise the profile of your organisation, say that. Outline clearly why this is important – maybe that’s because you think it will increase sales. If that’s the case, go back a couple of paragraphs and read that again. If it’s for another reason, make it clear what that is and you’ll get a better response. There’s no point at all in asking your agency to drive sales if your sales strategy is built around relationships and long-term pre-orders. Having said that, we once had a client who wanted ‘to be in the papers’, by which I assumed she meant ‘we want to sell this product’. Turns out the product was sold many times over for the next several years, and she just wanted the goodwill that some public exposure would generate. Fair enough – at least I knew the business background behind the brief. If you still think of marketing as a ‘nice-to-have’ rather than a valuable tool which can improve your business then you’re missing a trick. It can be the one thing which makes your business absolutely fly. When briefing an agency, start by looking at your business objectives. By the time you get to your agency brief, you should be able to draw a straight line between the two. I was recently told: “I hate it when an agency asks me for a budget, it really puts me off.” Look, you wouldn’t go and buy a car, or a house or anything else in the world without having an idea of how much you’re able to spend on it. It’s the reason you don’t walk into a Porsche dealership with enough budget for a Ford Fiesta. For the avoidance of doubt: reputable agencies don’t want a budget because they’re thinking about how comprehensively they can rinse you for cash. They want a budget because they want to know what level of resource they can commit to your campaign if they’re successful. End of. Providing a budget means you’ll get realistic proposals back. There’s no benefit to anyone – least of all you as the client – of having the budget for a Fiesta then having three people offer you a test drive in a new 911. OK, I get this. No-one wants to turn away business. But if you’re selling a premium product into a consumer audience, it’s unlikely that you’ll be targeting people whose household budgets are really stretched. Similarly, if you’re a B2B organisation, chances are there’s a particular role or profession which is the primary decision maker when it comes to purchasing your product or service. The more closely you can define the audience which really matters to you, the more accurate and effective your campaign will be. That’s not to say you should exclude all others, but there’s no reason why you can’t have a hierarchy of audience importance. By doing this, your agency has a chance to go and do some research into that audience, allowing them to develop campaign ideas which really work. Context is always important. That can be as simple as the history and heritage of the business, the background of the founders or senior team, or your short-term ambitions for growth. Agencies are looking for the colour that makes you stand out from your competitors, and that can come from the subtlest of nuances. We don’t need a 40-page document detailing your views on the impact of Brexit, but some germane information about the business helps bring the objectives to life. I genuinely had a client once who’d been asked by a previous agency if he would climb up a tree for a photo idea. Turns out he wasn’t crazy about the suggestion. Yes, agencies love to be creative. We love to show off. Generally speaking, we have pretty good judgement about what’ll work for your business or brand, and what might be a bit too out there. But if there’s anything you absolutely won’t do, put it in the brief. That doesn’t have to be that you have a horse phobia so the Lone Ranger video idea is off the cards. It might just be that you’ve tried something before and it really didn’t work. Whatever it is, neither of us wants to see that lovingly-crafted proposal fall apart five minutes into the pitch because we’ve stumbled onto a fatal clanger. Do you really want to sit through eight pitches? Or read eight detailed proposals? And the eight sets of questions (and follow-up questions) which you’ll have to answer before that? Find three, maybe four, agencies you think have the chops to answer your brief well, and go with that. If you’ve done your homework, you should get the answer you need. If you have too many agencies on the pitch list, you’ll find some of them won’t bother participating – with the best will in the world, we don’t want to commit loads of time to something with crazy long odds. And we’ll think you’re just mining for ideas anyway. A good proposal takes good time. Of course, you want things to get moving asap, and we don’t want to drag it out any longer than necessary either. But give us a couple of weeks, at least. Please. We do have other stuff to do as well. You’ll get a better response, I promise. OK, you don’t have to do this one. It’s your call, after all. But it’s jolly helpful for unsuccessful agencies to get some constructive feedback on why they didn’t win. If you’re providing feedback, specifics are always good – that genuinely helps the agency for their next pitch and only the most arrogant divas will take it personally. We will be absolutely gutted, though, and will convince ourselves you’ve made a terrible decision. So you sat through three pitches, and you reckon one of the agencies just nudged it. But, god, that one guy came across like a total jackass. But it was a great pitch. But he was a tool. Successful agency/client relationships are built on more than just great campaigns. Over the course of a contract, you’ll spend loads of time meeting and talking to your agency people, and if they’re not the sort of people you’d meet for a drink, do you really want to work with them? If you reckon you can endure it because you’re 100% convinced they can make a massive difference, fair enough. But maybe you speak to the agency boss and say you want someone else to work on that account. Or maybe you need to set clear parameters of the kind of behaviour you expect before you make the final appointment, and what’ll happen if the line is crossed. Either way, don’t be bounced into the wrong decision if you have a niggling doubt about personalities. Similarly, if you’re being promised the moon on a stick, dig a little deeper to discover the veracity of wild claims about results. You know the saying about things sounding too good to be true? That. After all of that, you’ve hired the right agency and you’re excited about getting started. You should expect the agency to take the lead in getting this moving; perhaps an initial strategy day before the final plan is submitted and agreed. Once you’ve agreed the plan, refined any objectives etc, set KPIs and ways of working, and let your agency get on with it. Micro-managing every little step will slow things down and get in the way of a successful campaign. Agree how and when the agency will update you on progress, how the sign-off process will work and so on, and get cracking. A good agency will inform you of any hiccups, but you’ll know if things aren’t going well. Wow. That was a bit longer than I was planning, but hopefully it shows the importance of a good brief and getting your agency relationship off to a good start. Bottom line is we want to do a great job so we feel proud of our work, and so you pat us on the back and ask us to do more work for you – it’s in all of our interests for the relationship to work really well. Am I being too harsh? Have I missed anything? Click here to get in touch and let me know what you think.